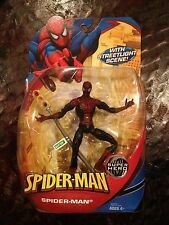 Marvel Legends Spiderman Mcfarlane Classics Toybiz 2001 Used. Condition is Used. Shipped with USPS Priority Mail. Item as described in title and image. From my personal collection. WHAT YOU SEE IS WHAT YOU GET. Item is used but in great condition see pics for details. Thanks for looking. 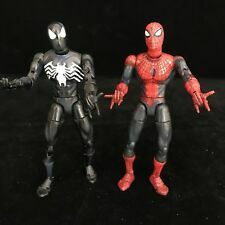 Marvel Legends / Spiderman Classics Line. AUTHENTIC USA VERSION (Not a Knockoff). Condition: USED only for display. Excellent conditions. Joints are good and work. See pictures. Details: What you see in the pictures is what you will receive. NEW super poseable Mcfarlane Spider-Man. Very rare. Serious inquiries only . Great collector piece. Mary Jane Watson / MJ. - Custom Todd McFarlane-style Spider-man, inspired by early McFarlane work, in TASM, not his solo "Spider-man" series See reference pic . Marvel Legends Scale. Original hands with articulated fingers have been modified for easy swapping. Pictures have been taken of the actual item. Super Poseable. Condition: Pre-Owned Nice used condition. Missing one magnet under left foot. All joints hold position. In photos on ring finger-That is a piece of fuzz. Marvel LegendsSpiderman. ~His leg joint is loose but still can poseable. ~What you see what you get in the picture. ~Rare and hard to find! Figure is brand new and factory sealed. Look at photos for condition. Please ask questions before buying. I work hard to exceed expectations. Great to work with. As described. A Simply the best! Up for Sale is aLOOSE Toybiz Marvel Legends Accessory Base Diorama. Superposable Spiderman Base. ~A great gift for your kid or friend. ~What you see what you get in the picture. ~Rare and hard to find! 1: Spider-Man Classics Series 1 Black Spidey Suit McFarlane Spidey (released 2002). 2: Spider-Man Classics Series 1 Red/Blue McFarlane Spidey (released 2002). This is the first wave of SMC introduced by Toy Biz in 2001.